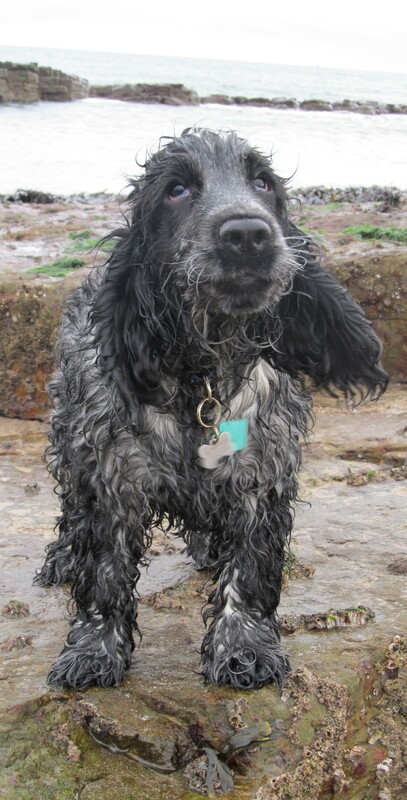 I am Pip, a blue roan cocker spaniel, and I began to write this blog when I was very young. A lot has happened to me since those days, and I have pondered much and learnt more. But one thing remains the same: my life is still gorgeous and I am still young at heart. I suppose now I am in the prime of life. My writing life depends on the good offices of my dearest friend, my Kemo Sabe as I have come to call her, the person who brought me here as a small boy and gave me a home among the Dickens Dogs. I emerged young as the first non-human writer in our household and, being different from all around me, I spend a lot of time considering existential matters as well as trying to make sense of things. Kemo Sabe helps me put my thoughts in order and to shape them in the light of literary and cultural history, in which we are all interested. So much that is written about, or even by dogs, is whimsical. We are lauded for our intelligence but ever patronised as mildly silly creatures, silly for our loyalty and love in the face of what is often a cruel and heartless humanity. My aim is to write about the unique bond between dogs and those we know and love – the world they share with us – with sensitivity and care. Our ears are always open and our minds are too. Above all we eschew cuteness, which has no place here. As for my background: my father is Scots, my mother from County Durham, which is where I was born. At eight weeks I was brought to live by the Northumberland coast where my horizons began to expand. Routines form an important part of our lives and it is on them that much dog happiness and security are based. These ordinary offices inform my thinking, as you will see. Meals, outings and going to bed are my favourite activities and I approach all of them with perhaps annoying excitement I simply cannot control without noise which has only marginally diminished as I have matured. I am a good house dog, always alert for the window cleaner or deliveries, as much a guard dog as Barnaby, who is several times bigger than I but perhaps not as sharp as tiny Nicholas, our miniature dachshund who is half my age. We have a lot of books in the house and we learn much from them. Many subjects make me think hard, such as why some dogs are better behaved and kinder than others and how the landscape in which we live came to look and feel this way. All around us, the wildlife of the Northumberland landscape and coast brings delight and sometimes close encounters which provoke deep feelings in us all. Mostly though, I feel the power of something special working deep within me, though I cannot always express it and have to pass over some things in silence, as someone very clever once said it was sometimes best to do. Please be patient with me and let me guide you through our world. Pip you are a handsome lad and I hope someday you have a female friend named Biddy. Thanks for checking out my blog. I will be posting more in the next day or two. I look forward to reading more of your musings and ponderings. Very cool blog. Thanks for following me, Pip. I look forward to hearing more about you! Thank you so much for reading with enjoyment; I love writing about my thoughts and it is good to know there is a small audience out there of like-minded souls. We will be following your blog from now on, too! Thank you for visiting me, it’s lovely to meet you. I’m looking forward to reading more of what you have to say. Thank you so much for commenting on how I look – I will soon be needing another haircut as my fur grows so quickly! My golden bbrothers join me in sending their love to your goldie, all the way over there in Kentucky. Mr. Pip, I just discovered your blog, and you’ve convinced me that your musings will be worth following. When I was a child, I was fortunate to have a cocker spaniel in the family, so I look forward to your thoughts. From cockers, I went on to enjoy the company of bassets, labs, sheepdogs, and various & sundry other dogs. In our retirement now, my husband and I are besotted with pugs. If your human likes dog stories other than yours, try http://maijaharrington.com, where I’m posting chapters from my book-in-progress, Funny Tails: Adventures and Misadventures in Living with Pugs. It’s a lighthearted look at life with the 3 pugs who call our house home, as well as the foster pugs who share our lives until they find their Forever Homes. We just love your blog. Junior is a rescued golden retriever therapy and reading dog. We just fond your blog and think it is awesome. My human partner and I are a therapy dog and READ dog team in Texas and we write about the human-animal bond and a bit of daily musing and mischief. I like to wear hats. Your block is really beautiful and we are now following and looking forward to keeping a conversation going. What a nice dog you are! Northern England sounds wonderful.